Each recipe in New York Times columnist Melissa Clark's Dinner is meant to be dinner—one fantastic dish that is so satisfying and flavor-forward it can stand alone—or be paired with a simple salad or fresh bread on the side. This is what Melissa Clark means by changing the game. Organized by main ingredient—chicken, meat, fish and seafood, eggs, pasta and noodles, tofu, vegetable dinners, grains, pizza, soups, and salads that mean it—Dinner covers an astonishing breadth of recipes. There is something for every mood, season, and the amount of time you have: sheet pan chicken laced with spicy harissa, burgers amped with chorizo, curried lentils with poached eggs, to name just a few dishes in this indispensable collection. Here, too, are easy flourishes that make dinner exceptional: stir charred lemon into pasta, toss creamy Caesar-like dressing on a grain bowl. 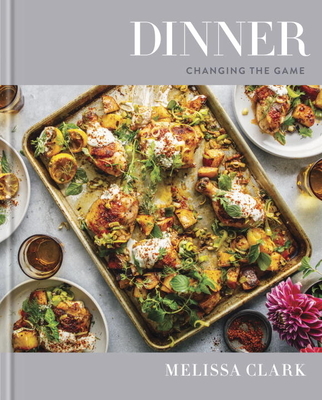 Melissa Clark is a staff writer for the New York Times, where she writes the Food section’s popular column, “A Good Appetite” and stars in a weekly complementary video series. The recipient of both IACP and James Beard awards, Clark appears frequently on “Today” and on public radio. She lives in Brooklyn with her husband and daughter.